WHAT’S UP WITH STAND UP TOKYO? It’s 2018 and Stand Up Tokyo is back, promoting the best English-language comedy nights in Tokyo! As usual, we have a fantastic show planned at Vega in Ebisu. Since it’s one of our longest-standing venues and perhaps the most enjoyable small show on the calendar, you should come. Vega is a beautiful – if cosy – room very close to Ebisu station. It’s surrounded by nice restaurants and a shrine, peacefully positioned just away from the hustle and bustle in a shadowy yet elegant backstreet. However, go downstairs on Saturday 27th January and you’ll find something juxtaposed against the quiet surroundings. Tokyo’s best stand-up comedians making the audience laugh like a riot! The energy gets pretty intense in this room, and with at least 8 comedians on the bill there’s something for everyone. We have comics from the UK, USA, Japan, Canada, New Zealand, Kenya, Holland, Egypt, France and many more. Hence, we here at Stand Up Tokyo like to keep it international. So as well as hearing all the crazy aspects of life here in Japan you’ll get to learn about some other cultures too. And when we say learn, we mean you’ll pee your pants laughing at how ridiculous all our cultures can be! WHO ARE STAND UP TOKYO? We are a collective of women and men from different countries around the world. And we are all currently living, performing and promoting comedy in and around Tokyo. 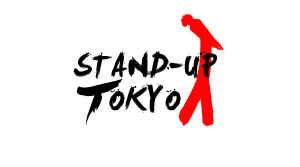 Stand Up Tokyo run nights all across the city, including an open mic at Otsuka and a weekly show at Shimokitazawa. So please get in contact if you’d like to try stand up comedy in Tokyo. This night at Vega is one of the originals, having a history dating back many years. Big Night Out at Vega has always been, and probably always will be, FREE entry. Please come and spend all your money on booze! It’s a small place so Stand Up Tokyo asks you respect the rest of the audience and performers. Therefore, please keep talking to a minimum during the show time. There will be a break in the middle. Vega is a non-smoking venue. See you at Vega at 8pm!